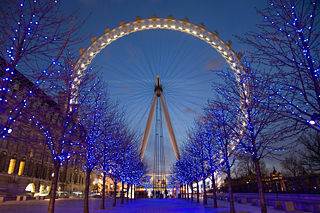 Yes, the London Eye is in fact a good mechanical model for a megascale AWES structure because it embodies the highly optimal structure of the classic bike wheel. No other wheel configuration scales so greatly with so much engineering confidence. For an AWES, we are mostly considering horizontal wheels similar to the KiteGen Carousel concept, but with an expanded capability to host many more kites without crowding. The AWES Forum contribution to this design space is envisioning a banked circular electric train (TGV) as a wheel rim, with wire rope spokes to a central hub with a large crank truss--a large sideways unicycle, in effect. Phased tugs to the crank by pumping cables from surrounding kite fields would drive the big wheel. TGVs as part of such a wheel would generate efficiently at the high speeds possible.